An immature male Anna's hummingbird visits a nectar-rich flower in Sedona, Ariz. In August, you can see the tiny creatures at festivals across the U.S. as they begin migrating south for the winter. Sometimes, big tourist attractions come in petite packages. If you’ve ever seen a hummingbird hover over a flower in search of sweet nectar, you know it’s hard not to fall in love with the tiny, colorful, lion-hearted ball of feathers. 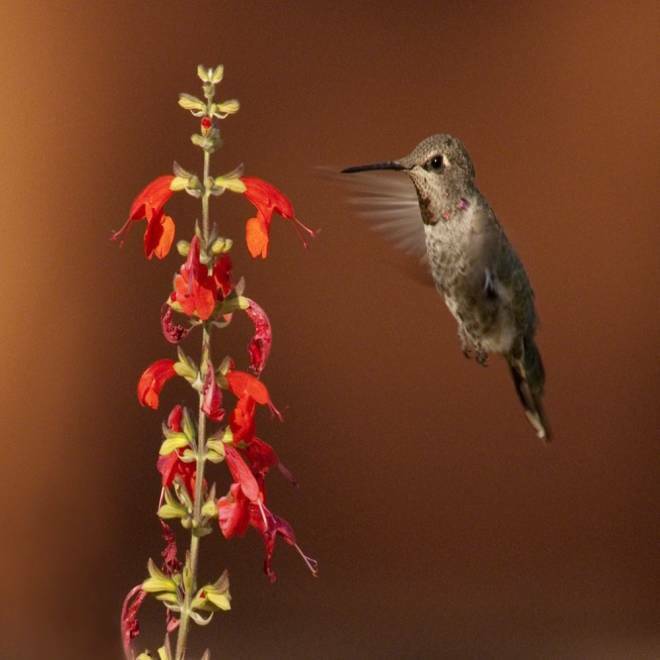 August kicks off several hummingbird festivals as the tiny creatures begin their migrations south for the winter -- sometimes a 3,000-mile journey -- and this year, the resort town of Sedona, Ariz., is joining in. 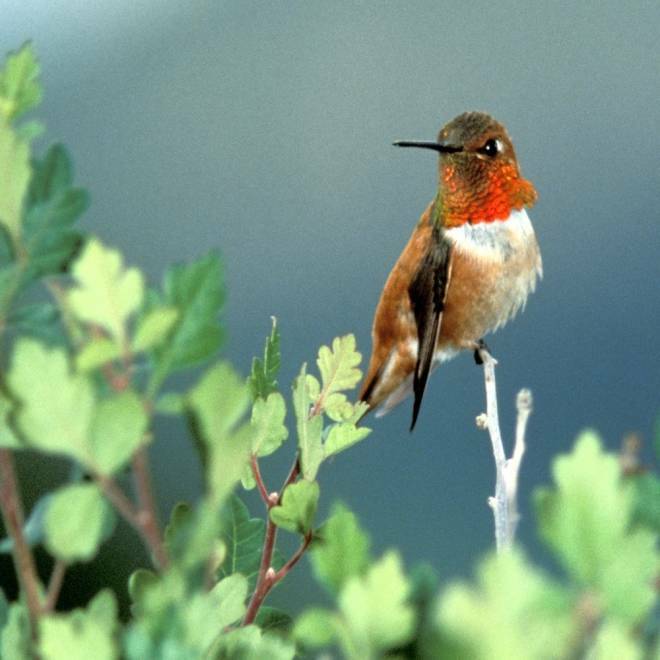 Hawkins is organizing the first Sedona Hummingbird Festival this weekend to showcase the five species of hummingbirds that can be spotted in the region this time of year. The town has at least two spots that attract 1,500 of the creatures every day. Why are we so enchanted by them? Part of it may be our fascination with things that are small, Hawkins said, and part of it is their incredible ability to hover, which no other bird can do. 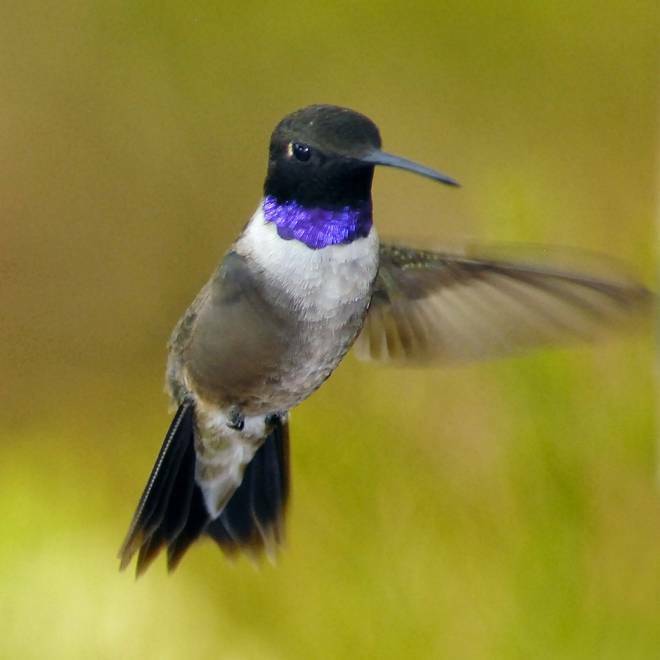 A mature male black-chinned hummingbird resides in Sedona, Ariz., from March through September, then migrates to its winter home in southern Mexico. A mature male Rufous Hummingbird rests during migration towards his winter home in Southern Mexico. But the main reason may be that it’s a creature with charisma. “There is the potential for interaction with hummingbirds that doesn’t seem to readily exist with many other species,” said Hawkins, who calls them fearless. He has an acquaintance who lives in Brazil and feeds a hummingbird that, when the nectar runs out, flies into the man’s house, searches for him, hovers in front of his face and squeaks at him. Hawkins also recalled reviving an exhausted hummingbird that his neighbor found inside a garage and brought over in an empty one-gallon pickle jar. Hawkins let the bird drink from a feeder, then put it in his open palm and waited for it to recover and fly away. “He lifts up about 6 inches and I thought, here he goes. But he didn’t. He came and turned toward me, flew right up to my face and with his bill, he tickled my moustache and then flew away,” Hawkins said. For your own close encounters with the tiny feathered kind, check out these celebrations in towns that are refueling stops for birds making their way from as far north as Anchorage, Alaska, to warmer digs in Mexico. Sedona Hummingbird Festival, Aug. 3-5, Sedona, Ariz.
Events include presentations from hummingbird experts, a sunrise breakfast at one of the town’s hummingbird “hot spots,” a banding demonstration, and shopping for hummingbird photos, art and merchandise at the “Hummingbird Mall.” Some activities are free, while others cost $10-$15. Hummingbird Festival, Aug. 4-5, Land Between The Lakes National Recreation Area in Golden Pond, Ky.
“During this time, up to 200 hummingbirds visit our feeders in a single day,” said Carrie Szwed, nature station interpreter. Learn about hummingbird photography and how to garden to attract the birds. Admission is $5 for adults. Henderson Hummingbird Hurrah, Aug. 18-19, Henderson, Minn. This event is billed as a celebration of the ruby-throated hummingbird and includes workshops, garden tours and hummingbird banding.